High salt restricts the growth and development of plants. A diverse range of genes are involved in the response to salt stress. Here we report that MdCAIP1 (C2-domain ABA Insensitive Protein1), a single C2-domain containing protein, has a conserved structure consisting of an eight-stranded anti-parallel β-sandwich. MdCAIP1 was able to bind to phospholipids in a Ca2+-dependent manner and localized to the plasma membrane. 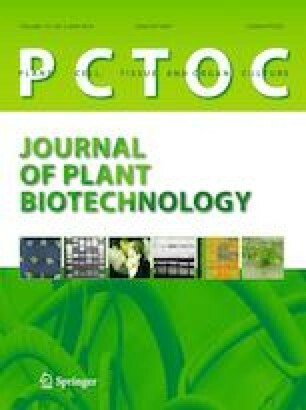 qRT-PCR analysis showed that MdCAIP1 was induced by abiotic stresses including salt, osmotic, and drought stress, as well as the hormone JA. Transgenic apple calli and Arabidopsis over-expressing MdCAIP1 were more tolerant to salt and osmotic stress, and had higher proline content and lower MDA content under these stressful conditions. Furthermore, MdCAIP1 could homodimerize. These results indicate that MdCAIP1 is a Ca2+-dependent phospholipid-binding protein, and implicate it in tolerance to salt and osmotic stress. MdCAIP1, a Ca2+-dependent phospholipid-binding protein, could homodimerize and positively regulated salt and osmotic tolerance in plants. Communicated by Konstantin V. Kiselev. Xiao-Juan Liu and Yuan-Hua Dong equally contributed to the work. The online version of this article ( https://doi.org/10.1007/s11240-019-01600-y) contains supplementary material, which is available to authorized users. This work was supported by grants from National Natural Science Foundation of China (31430074, U1706202), the Ministry of Agriculture of China (CARS-28), Shandong Province (SDAIT-06-03), and the Ministry of Education of China (IRT15R42). Y.J.H. planned and designed the research. X.J.L., Y.H.D. and X.L. performed experiments and analyzed the data. X.J.L., C.X.Y. and Y.J.H. wrote the manuscript. Supplementary material 1 (DOC 3519 kb) Figure. S1 qRT-PCR analysis of the expression level of MdCAIP1 in MdCAIP1 transgenic calli (A) and Arabidopsis (B). Figure. S2 The PAL (A), PPO (B) and PO (C) activtities in MdCAIP1 transgenic calli and wild tpye.